Here's a handy list of all the free crochet patterns I've posted on this blog. As always, I present these patterns to you for free with the understanding that they're mine. Mine, I tell you! Do not copy or sell these patterns, or the items you make with them, without my permission. These patterns are for personal and charity use only. Kthx. Everyone loves pandas! And when you wear this hat, everyone will love you too! The Panda Hat is a basic crocheted earflap hat with the added cute of bear ears! Add eyes and a nose to make it extra cute and all your own. Just don't be surprised if people try to hand you bamboo. When Miss Natalie was 6months old she was in the 90% percentile for height. If that's not Giraffe hat worthy, I don't know what is! This is a basic crocheted beanie with added earns and horn to make your little one into a little Giraffe! Modifications to make the hat smaller or larger are provided! The Snow Day Slouch is a lace-crocheted hat for when you want something different on your head. 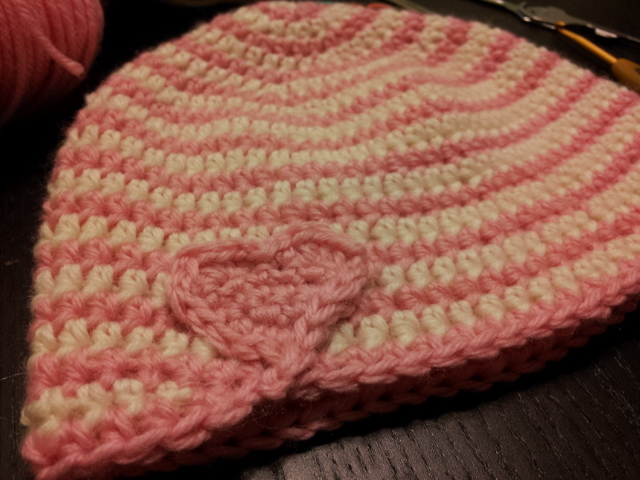 It features a knit brim, though a crocheted one can be used instead. These crocheted bowls are perfect for storage your various knick-knacks and crocheted Birds. They nest for easy storage and whip up super fast. For Valentine's Day one year Miss Natalie needed a new hat. Enter the Sweet Swirls. Crocheted with 4 strands of yarn in a continual spiral, this hat is definitely a wonder to behold. While these adorable dolls don't nest, they're still a great toy for little ones! The pattern shows you how to make three sized dolls that you can customize however you like.